Come down to OpenFest on Saturday, October 20th and support the opening of Portage & Main to people! This volunteer-run event is made possible thanks to musicians, artists and speakers donating their time. 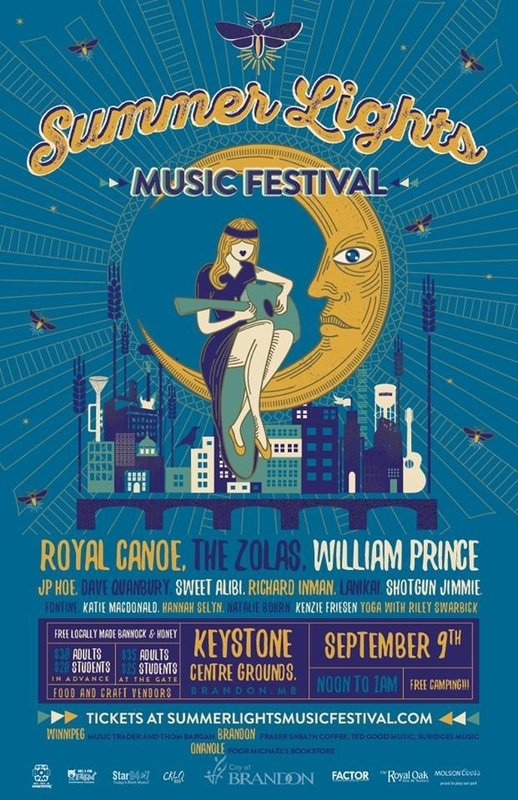 Expect an impressive lineup of local bands like Royal Canoe, Mahogany Frog, JP Hoe, Sweet Alibi, and more + your favourite local DJs, an open mic, craft beer, local food & drink, dancing, art, and poetry. Admission is FREE. If you'd like, you are welcome to make a donation to the Children's Rehabilitation Foundation (Any funds raised during the event will be donated). Open Mic hosted by The Purple Room in the beer garden at 201 portage. MAY 11, 2018 - JP and Quinzy are heading back to the Park Theatre; the special venue that helped shape JP's career and feels like and warm and cozy cashmere sweater. Reuniting with old friends Quinzy is always a special occasion to be celebrated and there's no better venue. This show is now sold out. Thank you. MAY 10-11, 2018 - JP and Quinzy are heading back to the Park Theatre; the special venue that helped shape JP's career and feels like and warm and cozy cashmere sweater. Reuniting with old friends Quinzy is always a special occasion to be celebrated and there's no better venue. The JP Hoe Trio composed of JP Hoe, Mariel Gonzalez (cello) and Matthew Harder (guitars), head west for a number of dates in April. 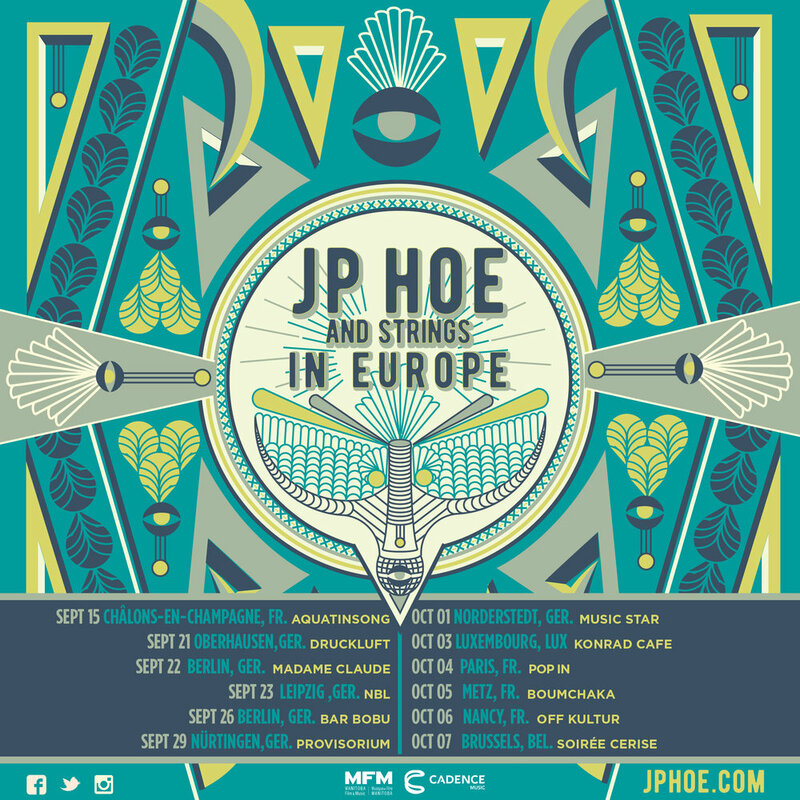 A combination of club and house concerts, the show features the best of a deft string section and soaring pop melodies, which JP is known for. JP heads back to the beautiful Kenmore Theatre in Morden MB. Additional details forthcoming. Presented by the Winnipeg Folk Festival, True North Entertainment, HUB Insurance, and media sponsors Virgin 103, 99.9 BOB FM, and TSN 1290. Feel free to share the pre sale info, everyone's welcome. FOURTH tour’s a charm for the JP Hoe band. This time around the six time Western Canadian Award nominee, with the soaring voice who pens deeply personal lyrics, is bringing an intimate show to the European mainland. Accompanied by a deft string section, this trio connects the lines of folk, pop and everything in between. Raw, dynamic, and incredibly unique; this set features a pair of Canada's finest classically trained musicians (Kelly Lefaive & Mariel Gonzalez) who also lend their stunning voices create the rich 3 part harmonies that leave audiences in awe. JP Hoe and band joins Wintersleep, Folk Road Show, and Pretty Faces at Rootstock. Rootstock 2017 happens on August 26th. Join us at the Flint Rock Ranch, take in the breathtaking scenery over the prairies of Pincher Creek and the Waterton mountains; enjoy a gorgeous farm-to-table meal, listen to performances by Wintersleep, JP Hoe, the Folk Road Show and Pretty Faces, and support Food Water Wellness Foundation in developing tools for environmental restoration through healthy food production. Start with cocktails and a farmers market where you can meet the folks responsible for the delicious food from which dinner will be prepared and hear the incredible harmonies of Pretty Faces. Indulge in an amazing 4-course feast conceived by David Cousineau of the Bison Restaurant and Terrace in Banff. Barb Tomas from Love2Eat will again orchestrate a delectable farm-fresh salad and dessert will be topped by Anne Sellmer’s Cochu Chocolates. A tent furnished with a country-chic mix of white tablecloths, mason jars, fresh flowers and candles will serve as a backdrop for this glorious feast, all nestled in the native pasture of the Porcupine Hills. The infectious energy of Juno winners Wintersleep caps off the evening after the stage has been heated up by Folk Road Show and JP Hoe. This dance floor under the stars will most definitely be hopping. Proceeds from this unique fundraiser further the work of Food Water Wellness in advancing the practice of regenerative agriculture that nurtures a robust ecosystem and healthy soil. Food Water Wellness Foundation is working to create an artificial intelligence tool that helps both farmers and researchers understand how soil can potentially be used to reverse climate change, increase biodiversity, mitigate both drought and flood and, most importantly, produce healthy food. This year camping will be offsite Flint Rock Ranch however we will be running buses from Pincher Creek and Cottonwood Campground and Heritage Acres. 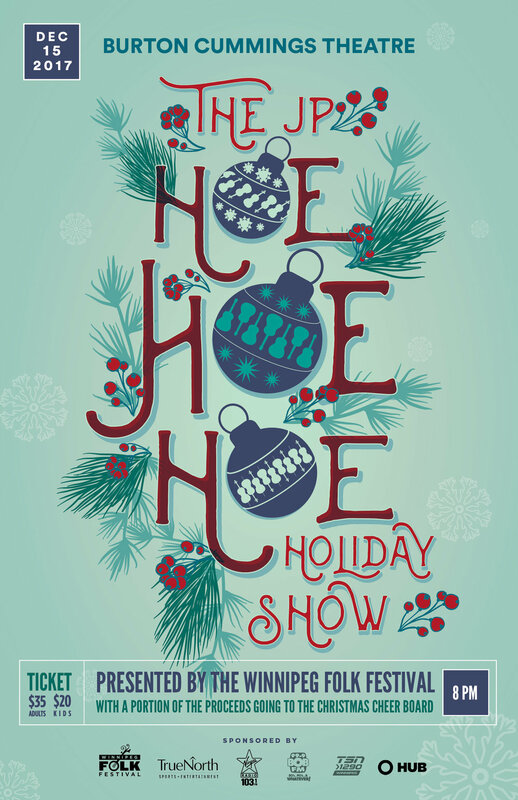 JP Hoe and band return to Calgary at the world famous Ironwood Stage & Grill. With special guests Folk Road Show, reserve your seat early and pack the house. JP Hoe and band join the list of entertainment at the 2017 Canada Summer Games at the Forks. SOLD OUT: Park Theatre presents JP HOE with special guests QUINZY on Friday, May 12th, 2017. Doors open at 7:15pm and the show will begin at 8:00pm. Once again, a portion of the proceeds go the Christmas Cheer Board.